A SATELLITE map has unearthed the charred remains of entire communities as terrified residents claim they are the targets of a new-world genocide. “Some people were beheaded, and many were cut. We were in the house hiding when [armed residents from a neighbouring village] were beheading people. When we saw that, we just ran out the back of the house,” said Sultan Ahmed, a 27-year-old man from the former Chut Pyin village in Myanmar. Rohingya people have lived for centuries in the western state of Rakhine, in Myanmar, but for decades have been persecuted by the Myanmar government. They are not considered among the country’s 135 official ethnic groups. The country has even denied them citizenship since 1982 and the state is one of the poorest in the country. On August 27, it is alleged Myanmar state security forces and local armed-residents committed mass killings of Rohingya Muslim men, women and children. The military unleashed what it called “clearance operations”. Myanmar’s army chief justified the slaughter as “unfinished business”. “The killing spree lasted for approximately five hours — from 2pm to 7pm” reported Fortify Rights. More than 2600 villages were burned down throughout the state. It is becoming one of the “deadliest bouts of violence involving the Muslim minority in decades”, according to Reuters. 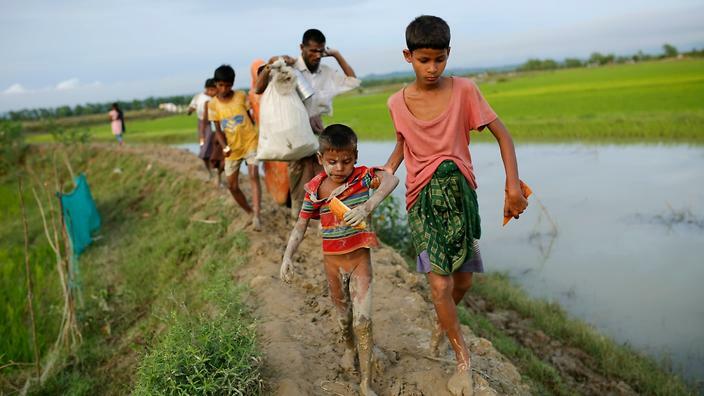 The United Nations Security Council will meet Wednesday to discuss the violence in Myanmar that has sent more than 300,000 Rohingya Muslims fleeing to Bangladesh, the council president said. Britain and Sweden requested the urgent meeting amid growing international concern over the ongoing violence in Rakhine state. “It’s a sign of the significant worry that Security Council members have about the situation that is continuing to deteriorate for the many Rohingyas who are seeking to flee Rakhine state,” British Ambassador Matthew Rycroft told reporters. The UN warning came as it emerged the Dalai Lama had written to Aung San Suu Kyi urging Myanmar’s de facto civilian leader to find a peaceful solution to the crisis in the mainly Buddhist country. The Rohingya, a stateless Muslim minority, have faced decades of persecution in Myanmar where they are regarded as illegal immigrants. But since the latest upsurge in violence on August 25, hundreds of thousands have flooded across the border into Bangladesh bringing stories of entire villages burned to the ground by Buddhist mobs and Myanmar troops. On Monday the UN human rights chief Zeid Ra’ad Al Hussein accused Myanmar of waging a “systematic attack” on the Rohingya and warned that “ethnic cleansing” seemed to be under way. “Because Myanmar has refused access to human rights investigators the current situation cannot yet be fully assessed, but the situation seems a textbook example of ethnic cleansing,” he told the UN Human Rights Council. Suu Kyi, a Nobel peace laureate, has come in for strong international criticism over the military crackdown on the Rohingya, which began when militants ambushed security forces on August 25. On Monday it emerged that the Dalai Lama had joined fellow Nobel peace laureates Malala Yousafzai and Archbishop Desmond Tutu in urging Suu Kyi to intervene. “Questions that are put to me suggest that many people have difficulty reconciling what appears to be happening to Muslims there with Myanmar’s reputation as a Buddhist country,” the Tibetan spiritual leader wrote in a letter to Suu Kyi shortly after the latest fighting broke out. “I appeal to you and your fellow leaders to reach out to all sections of society to try to restore friendly relations throughout the population in a spirit of peace and reconciliation. The UN refugee agency says at least 313,000 Rohingya have now arrived in Bangladesh from Myanmar’s Rakhine state since August 25, around a third of the total population of 1.1 million. The true figure could be even higher — the UN said many new arrivals are still on the move and are therefore left out of the calculations. Most have walked for days and the United Nations says many are sick, exhausted and in desperate need of shelter, food and water. “I had only water for the last five days,” she said, rocking on the spot in a yellow headscarf. 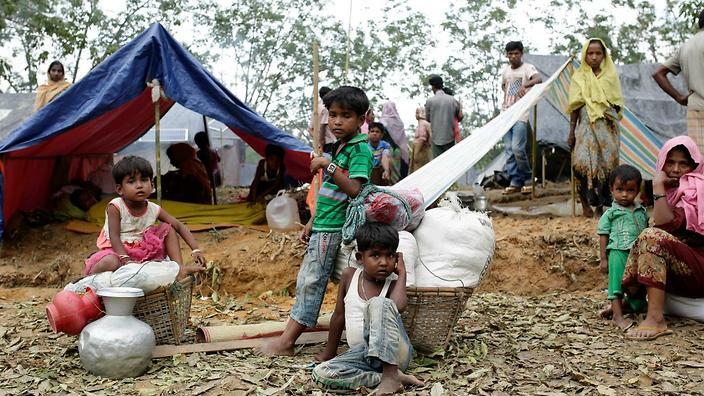 Refugee camps and makeshift settlements near the border with Myanmar already hosted hundreds of thousands of Rohingya before the latest influx and are now completely overwhelmed. Dhaka, which initially tried to block the Rohingya from entering, said Monday it would start registering all new arrivals. 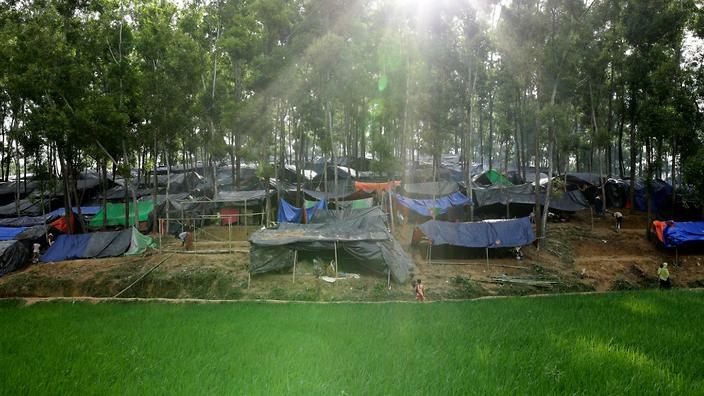 The Bangladesh government plans to build a huge new camp that will house a quarter of a million refugees. It remains unclear when or whether they will be able to return. The UN’s Zeid said he was “appalled” by reports that Myanmar security forces were laying mines near the border to stop the Rohingya returning. On Sunday the Arakan Rohingya Salvation Army militant group whose attacks sparked the latest crackdown, declared a unilateral ceasefire to allow aid to reach the increasingly desperate refugees.